Even auto draft wouldn't draft you Darnold or Taylor. Something doesn't seem right. I am in a 2QB league and unfortunately missed the draft. My original picks through autodraft were Darnold and Tyrod Taylor. As you can probably guess things went south when Tyrod was benched and people tend to stash QBs in the draft. To protect myself only Bills players were available for Week 1, so I picked up Peterman and Allen not knowing who would start. I used Taylor and Darnold until Tyrod was benched and had to switch to Allen. As you know all to well, Peterman was the only QB available until Derek Anderson showed up in week 7? I was forced to start Peterman in week 9 and actually got 12 points (probably because of the rushing TD) This week I'm still waiting for who will start, but I'm guessing it will be Peterman. Darnold has been lousy the last several weeks so on a whim I found McCown was available so I'm currently McCown/Peterman. It gets worse next week as everyone has a bye. I would try again next season unless you paid into it... missing the draft hurts you the more teams and positions there are. It sounds like you are in a 14 or 16 team league, so that's my advice. It's just too deep of a hole to come out of as Darnold is out several weeks and our QB carousel is terrible. Why would have drafted either of those 2?? Did you set up autodraft or did it just pick based on the default list? So, there would be such a thing as a waiver wire by which you can claim players, or a free agent list by which you can claim players. EVEN IF one autodrafts, you can still help yourself to great options that are out there. Not doing your due diligence in either of those areas is unacceptable... you had the option to pick up Fitzpatrick, Beathard, Mullens, Osweiler... I would be on it daily to work out acquisitions. I got Conner and Boyd because of that and I'm now 7-1. At tnis point your best bet would be to pick up a couple backups of QBs that may be benched soon or teams that give up a lot of QB hits and be ahead of the curve due to injury. Even with the arrest, Lauletta may see the field. Winston may end up back. Not kidding: AJ McCarron may see the field. Never know with Gruden. Kevin Hogan? Pick up whoever is starting for the 9ers if available. Maybe Lamar Jackson if you're really desperate. At least he plays in some different packages. Reported that Flacco has a hip injury so Jackson could be a good pickup but they have a bye this week. I was also affected by these teams. I'm in a 2-Defense league and have Denver on a bye so I needed another one. When I looked at who was available, the Bills and Niners caught my eye, with the Niners hosting the Giants on MNF. 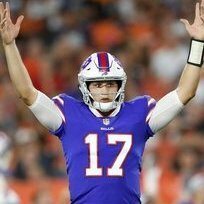 I thought about Darnold with all the INTs/turnovers so I went with the Bills. Then comes the news that Darnold wasn't likely to play and the Niners were now taken. In another league I have the Baltimore Def, also on a bye, so I picked up the Jets. So its the Bye week for all my starters and I had to pick up backups because trades were too expensive. The moral of the story don't sleep on draft night. Wow, you actually drafted Taylor? Drafting TT? not well at all. As for McClown...that's why i stopped playing fantasy, the logical choice is usually not the correct one. Could we please have more threads by people discussing their fantasy teams? I mean, they are just so fascinating. Maybe also a thread about people who take the time to read something they aren't interested in and then complain that they just read it. Your team is horrible man. Show up to the draft next year you ain't getting there with your QBs.. and I HATE 2 QB leagues too. Bad team. Bad League. Logical. Our pass D is insane. The Bills/Jets have been killing you all season, hate to break it to you. The bills have the worst O in the league, that CANT translate well into fantasy points.